You find that when you're in college, you need a lot of caffeinated coffee and tea to start out early in the morning. That means some trips to the college cafe which will undoubtedly be packed with other college students thinking the same thing as you. When you wait that long for your precious cup of coffee or tea, you don't want it to go cold quickly on you. And when you're getting it right before class and then furiously scribbling notes as your professor talks, you're going to find that you even forgot you bought a cup of coffee! You want to keep your coffee and tea hot, but how? With our Cozy Cup Heated Cup Sleeve, of course! 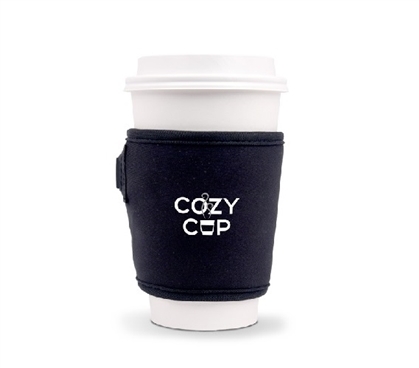 Our Cozy Cup Heated Cup Sleeve is one of those innovative dorm products that we love. This cool dorm essentials item has a lithium battery and on board USB lead to make charging easy. Simply slip your cup into this heated sleeve, push the button, and you will have heated coffee or tea for up to 90 minutes. You want to enjoy your coffee or tea - that means slowly drinking it and not gulping it down because it became cold. Keep your cafe drink warm while you study, walk to class in cold weather, and scribble notes during a lecture with our Cozy Cup Heated Cup Sleeve.